As the sun rises over the sawgrass marshes that mark the starting point of the St. Johns River, it slices through the mist that defines mornings in swampy central Florida. The rain that fell here overnight may evaporate in the afternoon, it may be used for irrigation, or it may wind its way along the length of the 310 miles of the St. Johns River and flow into the Atlantic Ocean. Note: If you go up (upstream) the river you go south toward it's source; if you go down (downstream) the river you go north toward the mouth. 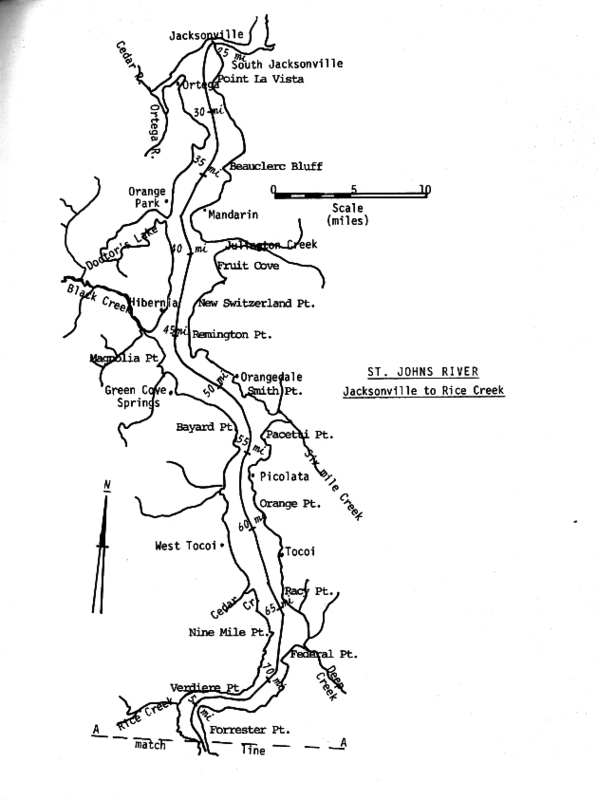 Downstream, the St. Johns will declare itself a mighty river, but here in Indian River and Brevard counties, there are few defined banks and boundaries. Waterfowl, wading birds, alligators, river otters and shore birds inhabit the maze of tributaries and sloughs. This portion of the river is fed mostly by rainfall, with the help of a few springs. The molecules of hydrogen and oxygen that mix in these shallow waters flow north -- unlike many North American rivers -- and begin a long, slow journey to the ocean. The St. Johns River is commonly divided into three drainage basins. Basins, also called watersheds, are land areas that drain into a water body. 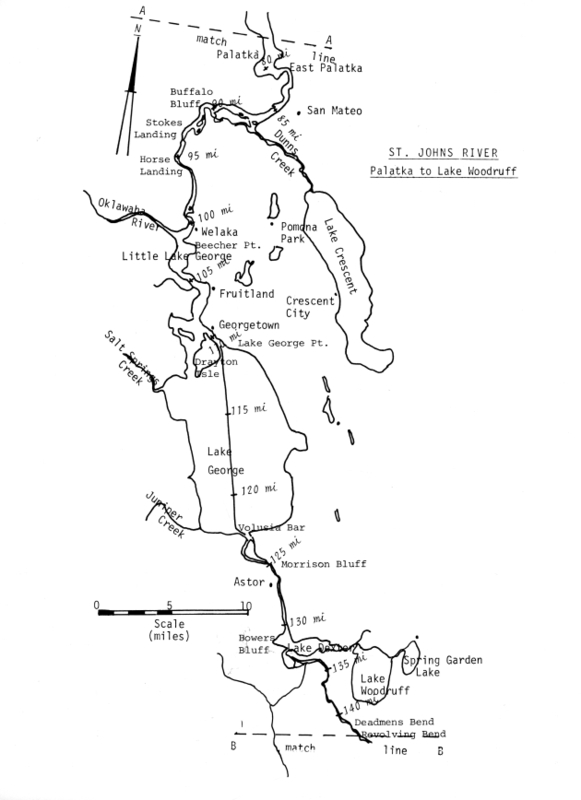 Because the St. Johns River flows north, the upper basin is the area to the south. The middle basin is the area in east-central Florida where the river widens. The lower basin is the area in northeast Florida from Putnam County to the river's mouth in Duval County, where it empties into the Atlantic Ocean. The water travels this path slowly. The river's total drop from beginning to end is less than 30 feet, or about one inch per mile, making it one of the "laziest" rivers in the world. Change has always come slowly for the St. Johns River. More than 100,000 years ago, much of the river was an arm of the Atlantic Ocean. Over time, ocean levels dropped and barrier islands prevented water from flowing east into the ocean, leaving it trapped in flat valleys. The water slowly meandered northward and formed the St. Johns River. The river, thus, is an ancient intracoastal lagoon system. As the river flows north and continues to collect water from marshes and springs, it forms countless lakes on its path. First comes Lake Hell 'n' Blazes, then Sawgrass Lake, Lake Washington, Lake Winder and Lake Poinsett. The river flows into Orange, Volusia and Seminole counties, forming Ruth Lake, Puzzle Lake and Lake Harney. Because of these lakes, the Timucuan Indians gave the river its original name, Welaka, meaning river of lakes. The Timucuan used the river for food, water and transportation for centuries before the Europeans arrived. The river has had many names. Spanish seamen renamed the river in the 1500s and called it Rio de Corrientes, or river of currents. In 1562 -- almost 50 years before the settlement in Jamestown -- the French established Fort Caroline on a high bluff overlooking the river they called Riviere de Mai, or river of May, because they arrived there on May 1. The establishment of Fort Caroline angered the Spanish, who marched north from St. Augustine in 1565, captured the fort and slaughtered the French. The Spanish then named the river San Mateo, honoring the saint whose feast followed the day they captured the river. Don Pedro Menendez de Aviles, commander of the Spanish army and founder of St. Augustine, was impressed with the St. Johns River. In 1596, he made a note in his diary: "The river seems to be full of goodly fish, and the forest inhabited by all kinds of birds and beasts, the meat of which is quite tasty." Later, the river was renamed Rio de San Juan after a Catholic mission near its mouth named San Juan del Puerto. The English translated that name into the St. Johns River, a name that lasted through English, Confederate and American possession of the river and remains today. The flow of the St. Johns River is strengthened south of Lake Harney by the confluence of the Econolockatchee River in Seminole County. After Lake Harney, the St. Johns begins a transformation. Banks become better defined and a recognizable river is formed that flows north of Sanford into lakes Jesup and Monroe. In her 1942 book Cross Creek, Marjorie Kinnan Rawlings wrote of this area. "If I could have, to hold forever, one brief place of time and beauty, I think I might choose the night on the high lonely bank above the St. Johns River," she wrote. These lonely banks mark the beginning of the river's middle basin. This area has historically been prized for its bass fishing, and boasts a diverse bird population that includes egrets, ibis and great blue herons, ospreys, turkeys, cranes and a sizeable population of bald eagles. Deer and a large number of alligators reside in protected areas here along the river's banks. One of these protected lands is the Lake Monroe Conservation Area. Owned by the St. Johns River Water Management District, 94 percent of the conservation area is wetlands that constitute the majority of the floodplain of Lake Monroe. The District has many properties open to the public <../../programs/outreach/pubs/recguide/recguide.html> and allows recreational activities on these lands whenever such activities don't pose a threat to protected water resources. The Lake Monroe Conservation Area allows hiking, fishing, horseback riding, bicycling, camping and boating in designated areas. North of Lake Monroe, the winding waterway consolidates and continues, straddling the county lines of Lake and Volusia counties. South of Lake Beresford, the river meets Blue Springs State Park, the ancient home of the Timucuan Indians and one of the modern-day homes of some of Florida's manatees. The banks of the river still display artifacts and mounds of discarded snail shells left by the Indians centuries ago. Beyond Blue Springs, the river enters a region of Florida famed for its resemblance to the Florida of legend. As the river runs through the Ocala National Forest and feeds into the Lake Woodruff National Wildlife Refuge, it feeds wet prairies, ponds and lakes. The Ocala National Forest is a landmark of Florida, being the most heavily visited of the state's three national forests. Regardless of its popularity, this part of the river offers a sense of solitude that is not easily paralleled. The land is lined with towering palms, large live oaks and scrubby sand pines. Behind the tree line, bobcats, panthers and black bears roam. The contiguous landscape goes on unspoiled for miles in every direction. Traveling through Ocala, one can more easily imagine the sense of adventure and awe that must have overtaken the first Europeans to see the region. Two of the most famous explorers of the river were John and William Bartram. In 1763, King George III sent the two to explore Florida, which England had recently acquired. William Bartram published his book Travels as a result, detailing his exploration of the river as far south as Lake Harney. In 1765, William Bartram wrote of the stretch of the river in what is now the Ocala National Forest. "...blessed land where the gods have amassed into one heap all the flowering plants, birds, fish and other wildlife of two continents in order to turn the rushing streams, the silent lake shores and the awe-abiding woodlands of this mysterious land into a true garden of Eden," he wrote. Here the river creates Lake George, the largest lake on the St. Johns River. Though it is large -- 12 miles long and six miles wide -- the lake is remarkably shallow, averaging only about 10 feet throughout. 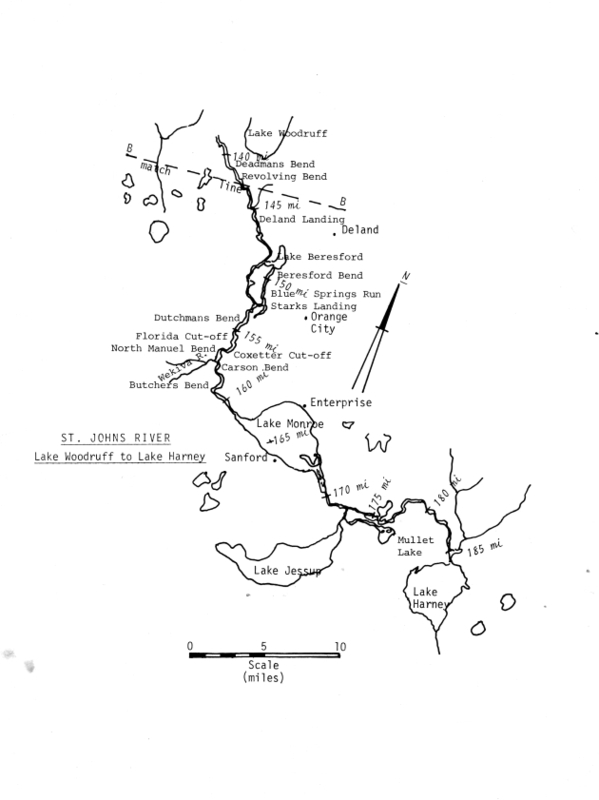 The water of Lake George is also variably brackish, or high in salt content. This is because the river flows so slowly it is influenced by the tide from the Atlantic Ocean for hundreds of miles upstream. In years when little rain has fallen, sharks have been seen in the river as far south as Lake George. Past Lake George, the St. Johns River goes through yet another transformation. It exits Volusia County and enters Putnam County, running along the Marion County line for a few miles. In Putnam County, the St. Johns River widens where it meets the Ocklawaha River, the largest tributary that meets the St. Johns. Here, the river enters its lower basin. After the St. Johns meets the Ocklawaha River, it flows along the Caravelle Ranch Wildlife Management Area for several miles. Jointly owned by the District and the Florida Fish and Wildlife Conservation Commission, the area helps the restoration of these two major rivers and protects threatened and endangered species. The hammock islands are favored nesting sites for bald eagles. Other significant wildlife species found here include alligator, gopher tortoise, eastern indigo snake, spotted turtle, Florida black bear, little blue and tri-colored heron, snowy egret, southeastern kestrel and limpkin. In the St. Johns River, manatee and snail bullhead can be seen as the river continues its half-completed journey north. Several miles downstream, the St. Johns River runs through the city of Palatka. Originally named Pilotaikita, a Seminole word for "boat crossing," the area has been used for hundreds of years as a transportation hub on the river. 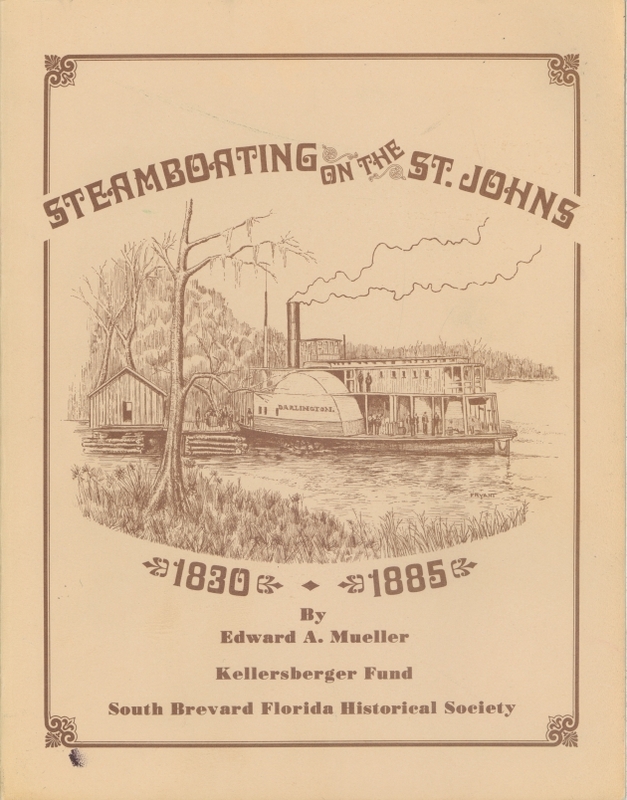 Transportation has always been an important use of the St. Johns River. When William Bartram sailed down the river, he stopped briefly at an Indian village on the very spot where Palatka is located. Into the 1830s, the area was a trading post, until Fort Shannon was built there in 1935 to secure the strategic location during the Seminole Indian Wars. In the 1850s, Palatka became a port of entry into the interior of the state. Steamboats brought tourism and were vital to the city's economy until the 1920s. Modern ships still traverse the river. Cruise lines, recreational boats and commercial shipping are interwoven into the river's economy. North of Palatka, ships on the St. Johns River see a much more expansive river as it continues. As the river straddles the St. Johns County line, leaving Putnam County for Clay County, it widens considerably, averaging up to two miles across. Standing on one of these ships one sees the St. Johns for what it is, a powerful and steady force of nature. On the west shore of the river between Palatka and Jacksonville lies the District's Bayard Conservation Area. For roughly seven miles, the river is bordered with riverine bottomland hardwoods, pine flatwoods and sandhill communities. Woodland birds, such as warblers and woodpeckers, share the area with an assortment of creatures. The river crosses out of St. Johns County and then Clay County and completely enters Duval County and the heart of Jacksonville. This is the largest city in Florida and, like Palatka, was founded with the river as its primary asset. The U.S. Navy presently has several bases in Jacksonville along the river, contributing greatly to the local economy. Additionally, gypsum, oil depots, and a variety of commercial traffic strengthen the city's economy. In Jacksonville, the river turns sharply to the east toward the Atlantic Ocean, only a few miles away. Here, the river is always a mix of fresh and salt water, making the St. Johns River more an estuary than a freshwater body. An estuary is a place where freshwater meets salt water, and is home to an extraordinary diversity of life. The beauty and diversity of this region is punctuated by sandy barrier islands, inlets and a combination of sounds, rivers and extensive coastal marshes. As it leaves Jacksonville and runs along the spot Fort Caroline stood long ago, the St. Johns River meets the Intracoastal Waterway, forming an expanse of marshes with fluctuating depths. Due to the fact the mouth of the river was often shallow, jetties were built here at the end of the 19th century, allowing Jacksonville to become a viable ocean-going port. Jetties are pier-like structures that project into a body of water to influence the current or tide or to protect a shoreline from storms or erosion. Improvements through the 20th century have prevented erosion along the river. After passing Mayport, the longest river contained in the state of Florida ends its journey where it spills into the Atlantic Ocean. Over its length of hundreds of miles, it has collected runoff from thousands of square miles of land. But here, things don't seem to be measured in miles or gallons. Where the ocean envelops the St. Johns River with a docile embrace, the sky and the ocean seem to stretch on endlessly. As the sun sets over Florida, the water cycle continues. It is likely that some of the unfathomable amount of molecules gushing into the ocean will rise into the sky and fall into the St. Johns' watershed again. The resources offered by the river will continue to sustain Florida's residents in many ways. With responsible human stewardship, the beauty, tradition and abundance of this great river will flow on.